Gread Elettronica, operates in the design and production of hardware and software, and in the supply of services and computer products. The company needed to create a connection and an industrial coverage between two production areas 10 m apart, in order to ensure a sheltered crossing to move the material. Due to technical and bureaucratic restrictions, the construction of the structure would have involved a partial interruption of the activities and rather long times for obtaining the necessary permits. In order to avoid the licensing problems and to continue production while waiting for the permanent canopy, Gread Elettronica entrusted its business to Ready Box 2. This allowed the creation of a mobile temporary roof between the two buildings, without any technical or architectural modification to the existing constructions. Specifically, Gread Elettronica, following the advice of the team of experts provided by Giulio Barbieri S.r.l., has chosen to purchase 2 Ready Box Tunnels of 3.7m x 3.7m each, joined by a connecting strip. This allowed leaving a part of the tunnel extended and keeping the second one folded up or to create a single covered connecting tunnel of larger dimensions, depending on the company's needs. This solution has also enabled the company to speed up the transfer from the inside of the industrial warehouse to the outside, without having to create a new access point and thus containing costs. In order to ensure a firm seal in case of wind and snow, the connecting tunnel was secured to a wall of the adjacent building and to the ground by means of additional hooks. On both retractable tunnels, the company has also chosen to insert a windowed wall for a greater brightness of the covered areas and to make the transit of forklifts safer. Despite being medium-large structures, the two Ready Box 2 tunnels were installed directly by Gread Elettronica staff in just under half a day's work, allowing the company to immediately use the new connection point to facilitate production and logistics. 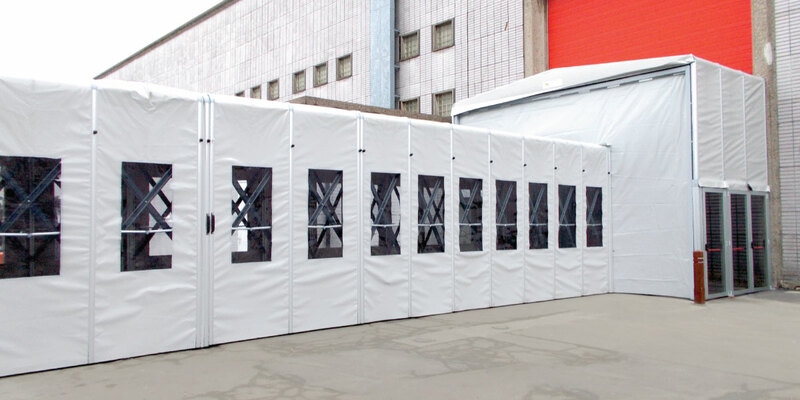 About a year and a half later, after obtaining the authorisations for the construction of the permanent canopy, Gread Elettronica converted the use of Ready Box 2 from a connecting tunnel to a temporary warehouse. The ease of transportation and relocation due to the practical pantograph opening and closing system and the lightness of the aluminium components of the structure, allowed the company to move the Ready Box to a different factory, where they needed to create a large covered and sheltered area for the storage of material deposited on pallets. In order to make the new storage space more weatherproof, Gread Elettronica asked the Ferrara-based company for some additional accessories to be added to the tunnel they already had. The additions included a permanent rear closure in PVC with windows, a front closure in PVC with windows, which can be opened on both sides to facilitate the loading and unloading of goods, and two gables to complete the covering of the structure. Two needs, one single solution: Ready Box retractable tunnel by Giulio Barbieri, which in a few simple steps, thanks to the wide possibility of customisation and versatility of use, has been able to respond promptly to two specific and different production requirements while containing costs and times of construction.